Can You Show Me Homes in Delaware on Higher Ground? Delaware may not have mountains, but we have something for everyone. This one always makes me laugh. Delaware is flat, if you haven’t noticed. My aging knees are very happy I can ride my bike for hours and hours on nice flat paths and roads. But if you are looking for mountains, you won’t find them in Delaware. Bill Bell and I recently took a week’s vacation and visited Charlotte and Asheville in North Carolina. Both are thriving cities with lots of cranes in the air. Both are also places some of our clients have considered before settling in Delaware. Charlotte has become a large city with all of the good and bad that goes along with that. Lots of development surrounds Charlotte with large gated communities from the likes of Del Webb. One of the good things is the Charlotte Airport, which has become a hub for both domestic and international travel. Traffic is one of the bad things and the next time I hear someone talk about traffic here in Delaware, I will give them a long look! Then we spent four days in Asheville and had a wonderful time. The art scene is everywhere from the Biltmore to the River Arts District to the Grove Park Inn and Village. It’s a foodie town for sure and we had some great meals. My favorite was Curate; some of the others were a bit too unique for Bill. We stayed in town and walked everywhere. Those hills were fine when we were walking down but I’m glad we could call an Uber when it was time to walk back up. The mountains are awesome to look at but a little scary to drive. We saw cyclists on those mountain roads, no bike lanes, and I marveled at their strength and fearlessness. I could not even drive on those mountain roads getting to and from Asheville. When we took the Blue Ridge Parkway heading home and ended up in the clouds, I nearly panicked. I wonder how people living on the sides of mountains navigate those driveways! When I was younger and height didn’t bother me, I always thought it would be cool to live in an A-Frame on the side of a mountain; now I can’t even look! Whenever we travel, and we love to take trips by car and explore, I always think about how people decide where to relocate, especially at retirement age. If we move, I think we all look for a place with lots of activity and a variety of things to do. For many, great restaurants and a vibrant art scene are important. Proximity to the beach is a must for some while others long for mountain views. One might prefer a highrise condo in the heart of a bustling city; another person longs for a peaceful home in the country. There are outdoor people and those who prefer to curl up with a good book by the fireside. Vive la difference! Why do I think Delaware has become such a popular retirement destination? It’s all about location. For a small state, we have a bit of everything. We have the beach resorts. We have great restaurants. We have the arts and this scene is growing every year. We also have quick access to multiple metropolitan areas, not just one. Within three or four hours, we can be in Washington, D.C,, Baltimore, Philadelphia, New York City, and everything in between. For major airports, we have Philadelphia and Baltimore within two hours. That might be a long drive if you did it every week, but for retirees going on vacation or a family visit, it’s less than many working peoples’ commutes. Delaware is missing a few things like mountains but we do have four seasons—none of which are terribly extreme. When we arrived home from this last trip, I was happy to be home. Even if I could afford multiple homes I would still keep the one I have in Lewes, Delaware. My husband and partner, Bill Bell, has lived in Delaware most of his life. A few of our agents and staff, like Audrey Hammond, Judy Robinson, and our newer agents, Ron Mercante and Anthony Bell, also grew up here. From the time I left New Jersey at 17 until I moved here at 50, I lived all over this country.Read more about my history on this blog, Where are you from? Now, Delaware has become home to me. As long as you are okay without higher ground, we hope Delaware will become your home too. Contact us today to find out how the Active Adults Realty team can help. 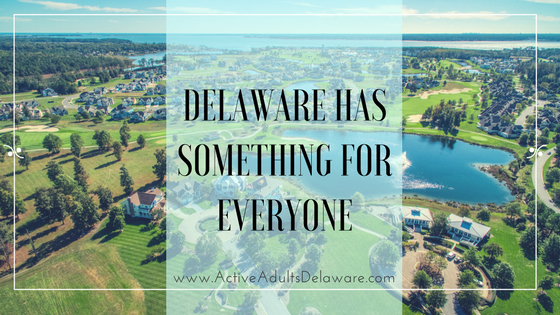 If you are considering a new home in Delaware, sign up for our Delaware Community Update, which will help you understand how many choices we have in Delaware – we have something for everyone!